I grew this tree from seed and started shaping it after the first year. 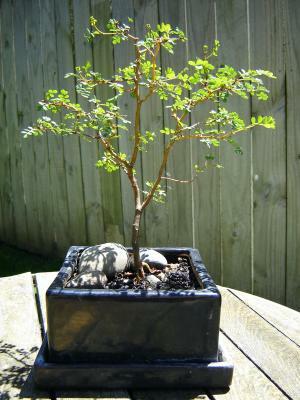 During Winter 2007 I root pruned and repotted it. I have begun developing exposed roots to add some character. My intention from here is to further develop it while keeping it this size. I have also started another kowhai which will be a flattened, wind-swept shape perched on top of a rock formation. Comments for Kohwhai - first attempt at Bonsai! Work on your harmony...the pots are too big for the plant...plant it in ground first ...when fat enough then you may place it here...or buy a smaller pot... consistency in size matters...that's tip from a master. I cant stop imaginating this Kohwhai as a Flat Top tree.Just remove the top branch of the tree.Anyway that,s just my opinion..I,ve heard a Bonsai Sifu said...LESS IS MORE...Bonsai Forever. cool tree! I'm about to start work on a kowhai myself, any tips? apismells@yahoo.co.nz. any help will be appreciated.